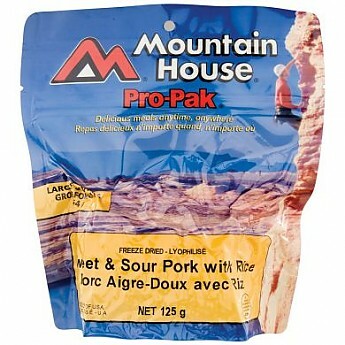 Another comfort-food staple delivered to you by Mountain House, and while it may be without the trademark, white, paper takeout box, one bite of this and you'll swear it was delivery. The DiGiorno of Chinese food, for backpackers. My second-favorite meal, only to their Chili Mac, and a nice, rice-based alternative to the other pasta-centered dishes. Asian food that tastes like — Asian food! Better than the Teriyaki! I bought this because REI was out of Stroganoff AND Lasagna, and this was the next best-looking dish they'd for sale. 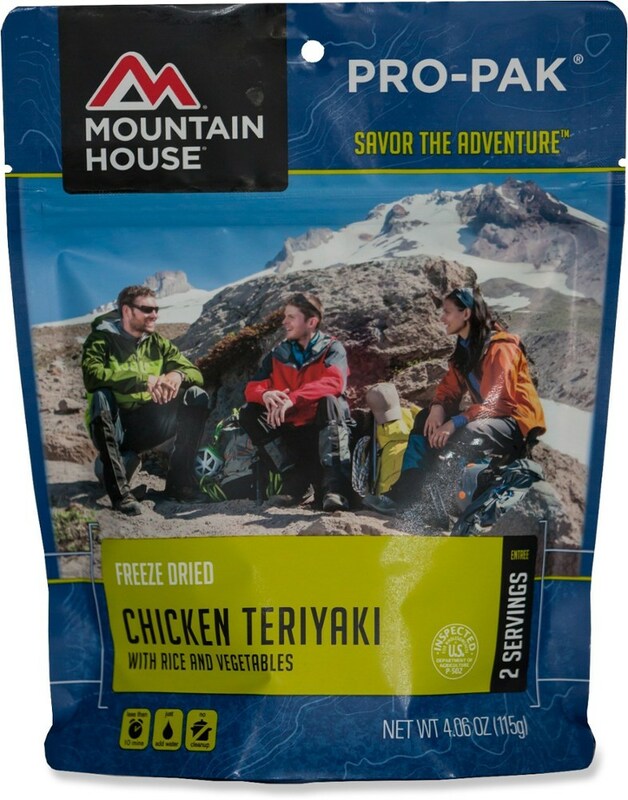 I tried the MH Teriyaki before, and wasn't impressed with how genuinely "Teriyaki" tasting it was. Then again, Chinese food and pizza are much the same to me — even when they're mediocre, they're still pretty damn good, hot or cold. Pleased to say I don't regret this purchase one bit, and I place it currently behind their Chili Mac as my second-favorite MH meal. No different than any other standard package of MH food. All I need to cook this is a stove and small pot: boil 2 cups (or 16 oz) of water, pour it inside the re-sealable pouch, and let it sit for 8-9 minutes. TIP: let this one rest inside the bag a little longer than the 8-9 minutes MH suggests. 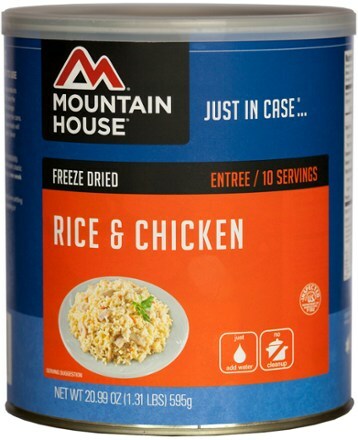 I've made this a cardinal rule will ALL my Mountain House and ALL my dehydrated meals. Especially for rice dishes, you're going to want to give these meals a few more minutes to soak up all that boiling water. If you're game for crunchy rice, dive on in at the suggested time, but for most folks, you're going to want that rice al dente, at the least. All I need to eat this is a spoon: you can eat straight from the bag. 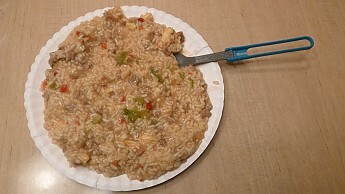 I like rice dishes because they're really easy to eat with a spoon, and you can usually get a little bit of everything into a single bite. Rice is my preferred starch and I usually defer to it, when possible. Seriously, though, this is a dish that actually lives up to the name, and tastes like it should. There is no generic "Asian-flavored" sauce. There are individual and separate flavors, here, and the combination of them makes this a really enjoyable meal. It's a textbook version of S&S, but one that's well-executed and prefers tradition and simplicity to anything else. Mountain House really does do this one justice. 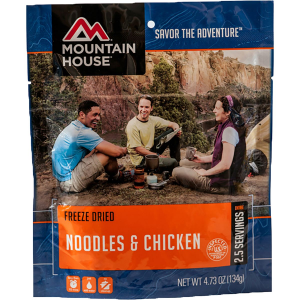 I could take a scoop of this from a paper takeout box, and think someone had Chinese food delivered straight to my campsite (if there are any Chinese delivery joints that do deliver to campsites, please let me know). 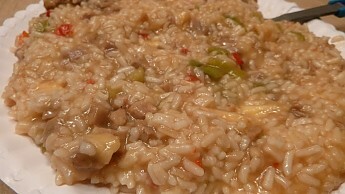 The texture is varied and interesting throughout, and again, why I prefer rice meals. You generally don't have to decide between noodles and the rest of the ingredients to enjoy all the flavors at once. My favorite part was the unexpected, sweet kick from the pineapple. 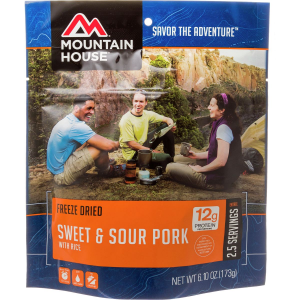 Sure, this is a requisite component for a "Sweet and Sour" dish, but rarely if ever do you find a fruity flavor in your backpacking, freeze-dried meals. I'm not much of a guy for fruit, and I was all about this pineapple. 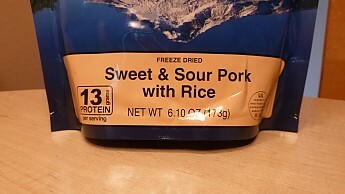 The other notable flavor would be the pork. You actually, legitimately taste it, and this isn't a dish where a sauce overpowers the rest the ingredients. The savoriness balances well with the sweet ting you get from the pineapple. There're more than enough pieces of the pork, too, that you can get a little into every bite. 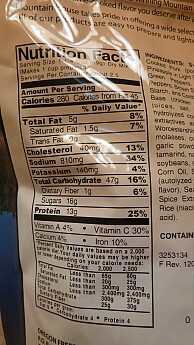 240 calories per serving, 2.5 servings per bag. 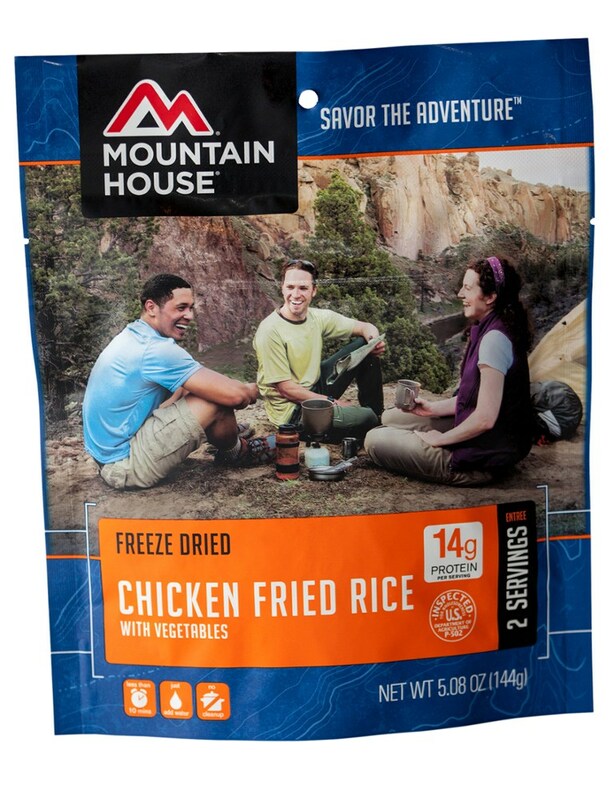 This actually was a 2.5-serving meal, mostly because rice is an inexpensive ingredient and thy can really pack a lot of it into these pouches. Rice is a filling starch, but one I've never felt overstuffed eating. Suffice it to say, this one was worth the wait. 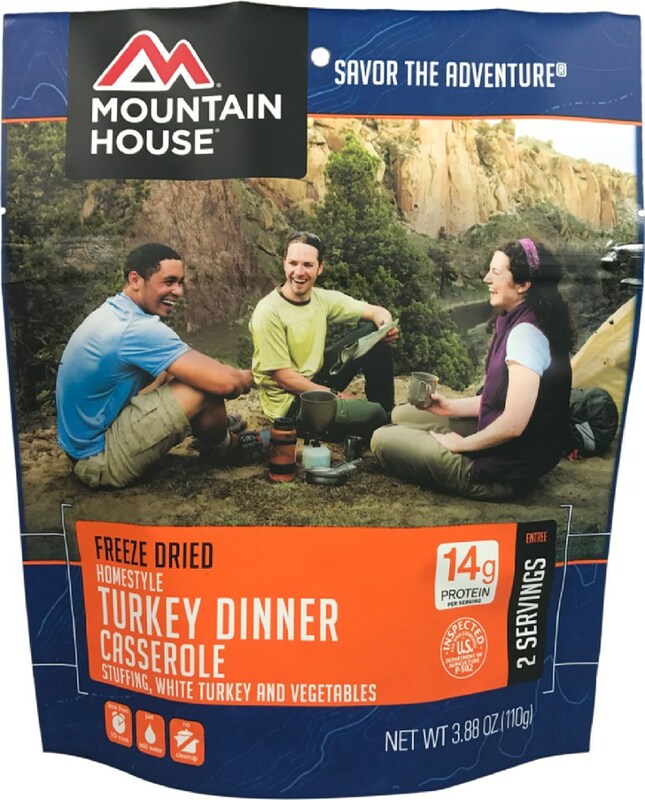 Once I got home, I plopped my pack down in the kitchen, grabbed this bag and my pot, and made the meal on the stove without missing a beat. May not have enjoyed it on the trail, but I enjoyed it, nonetheless. I usually sprinkle a dash (or several) of black pepper on my food, as it's an easy way to gain flavor without gaining more sodium atop an already sodium-laden dish (810 mg, in this case). Even if you don't have any, it's varied enough in flavors that you could do well without it, and enjoy it just as much. To get the most out of this meal, stir it both prior to adding water, and prior to eating, so you can really sample all the components at once. The ingredients are good by themselves, but really come out when you combine them all together. 5 stars. I know I've got to say something negative to make this a thoughtful review, but really, my only regret was in buying only one pouch. Would've taken this over the BP meal I had, easily. Reasonable taste, good variety of textures, rice is poor. 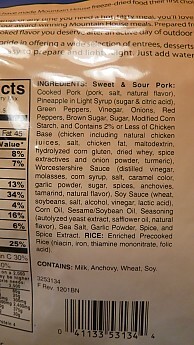 Lots of pork and pineapple. 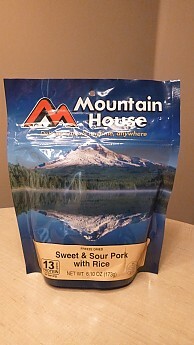 Mountain House Pro-Pak Sweet & Sour Pork with Rice is a dehydrated meal, and like most Mountain House products, it rehydrates well and provides a lot of calories (380/bag). The pro-pak only weighs 125 grams, and the bags are pretty much indestructible, so they are especially good for backpacking. Good for elevation, too — the pro-paks won't expand as you ascend. 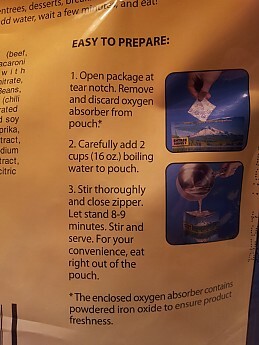 Preparation is simple: add boiling water, seal the bag, and let sit for 9-10 minutes. Stir and serve. 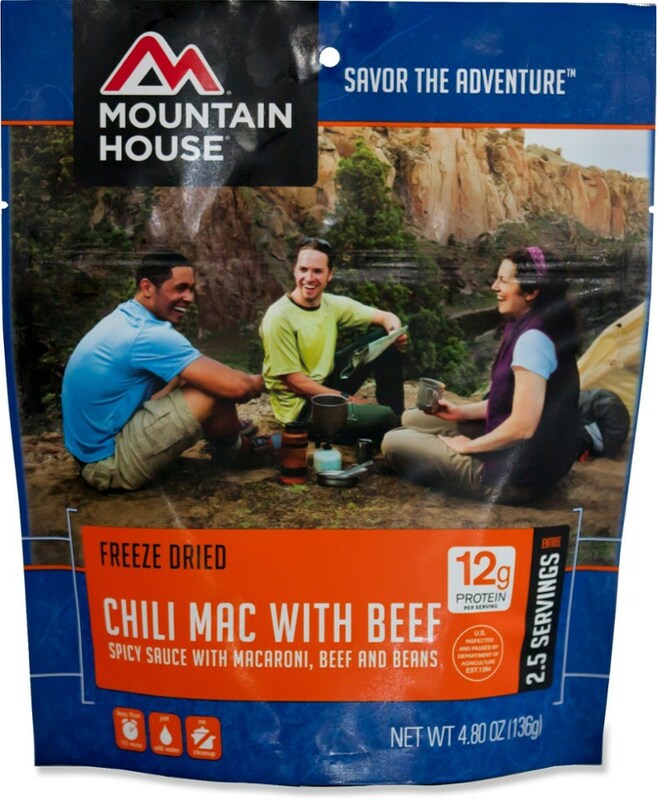 I used this at a campsite where we had access to a propane stove, and it delivered a decent meal in a short time. The serving size was one per person, so less than some of the other meals available (at 1-2 servings), but with that size of portion, both myself and my guest were full. The pieces of pork were 1/4 to 3/8" and while they cooked well enough, they were still a bit chewy. With green and red peppers and onions, there is a good variety of flavours, and the chunks of pineapple were a nice touch, making the dish a bit closer to the kind of thing you'd expect from a Chinese takeout place. However, there was one glaring error. The grains of rice were small and textureless, reminding me of 'Minute Rice' but without the taste. Drowned in the sauce, the texture was less noticeable, but I wonder if they couldn't have found something that would be more palatable. Have a good look at the ingredients list, though. If you have concerns with extra salt or sugar, this meal is high in both, with 1020 mg of sodium and 28 grams of sugar per bag. You might also note that while it's a 'pork' dish, it's created on a chicken base. All in all, not bad. I'd buy it again, if only for the variety, but I can't place it on a par with the kind of food you could buy at a restaurant or prepare on your own. 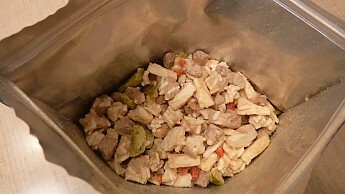 As is often the case with freeze-dried meals, sometimes one forgets to keep track of the time the water went in. In this case the food cooked for at least an extra 5 minutes. Cooking times also vary with elevation, but that wouldn't have been a factor here. Seems to really hit the spot when you're cold, hungry, and tired. 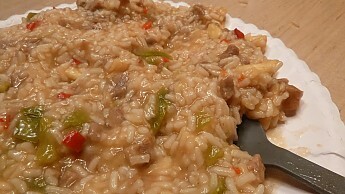 I initially had low expectations, but after heating it up I was surprised how good it tasted. Sure this isn't gourmet food, but after a long, cold day it exceeded my expectations. Neither my wife nor I are particularly picky eaters, so we were both rather pleased. The pork was tender, it had a fair number of vegetables, and the combination of sweet, sour, and salty hit the spot. 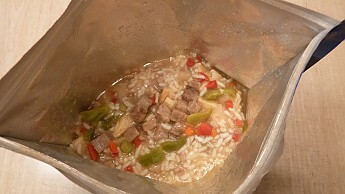 The rice reconstituted well, but was a little gluey (like any instant rice). 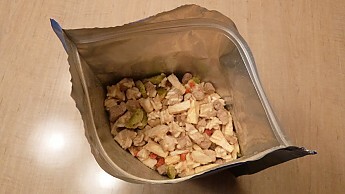 Like most freeze-dried meals it was easy to prepare (just add boiling water and let sit for 15 minutes). My wife and I shared a 2-person serving, and since we were both famished it left both of us a little on the hungry side. We've bought a couple of more packs of this, and will probably take them on our next trip. Tried this at home. Meat is a little chewy but that's to be expected with this kind of meal. Had little bits of pineapple even. I had no problem eating the two-person meal by myself. It said it made 20 oz. I was really full after eating it.